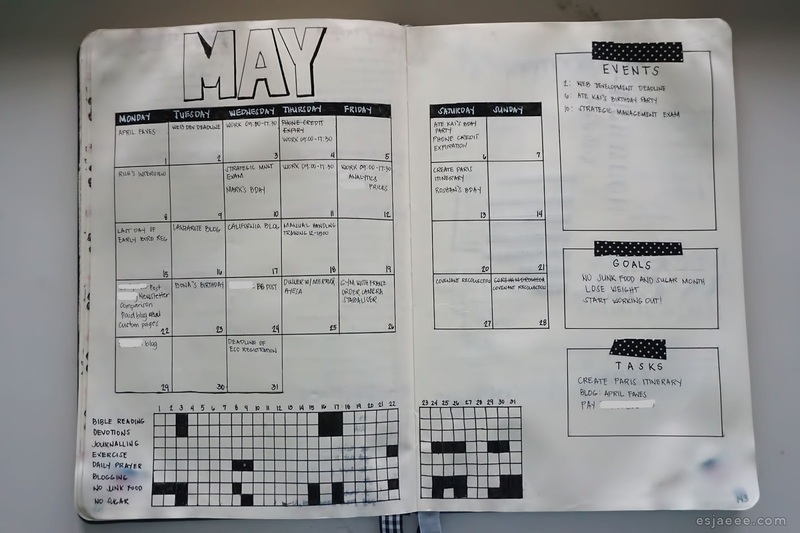 I have been bullet journalling for over a year and I love the system. I wish I discovered this system when I was in my early years of college. 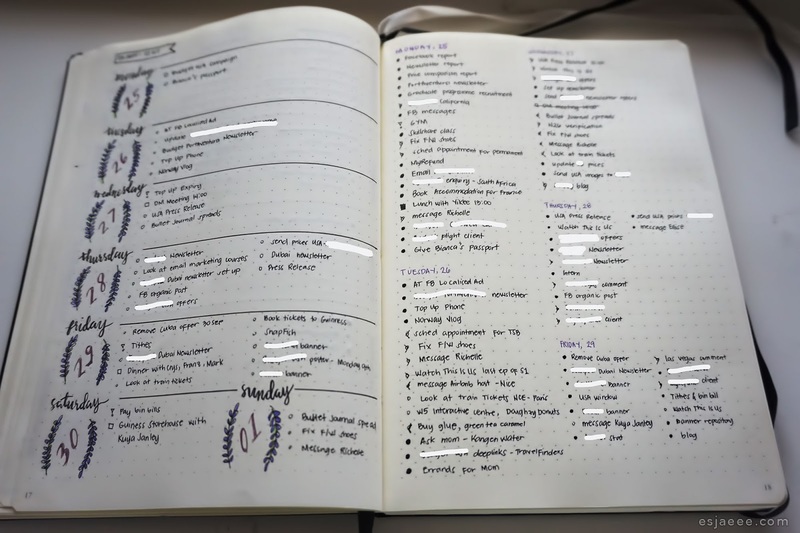 I've only started doing this during my final year in college and I would have not known about the Bullet Journal from my 'seastar from another blood' Bianca of Cosmetique-Cosmos. 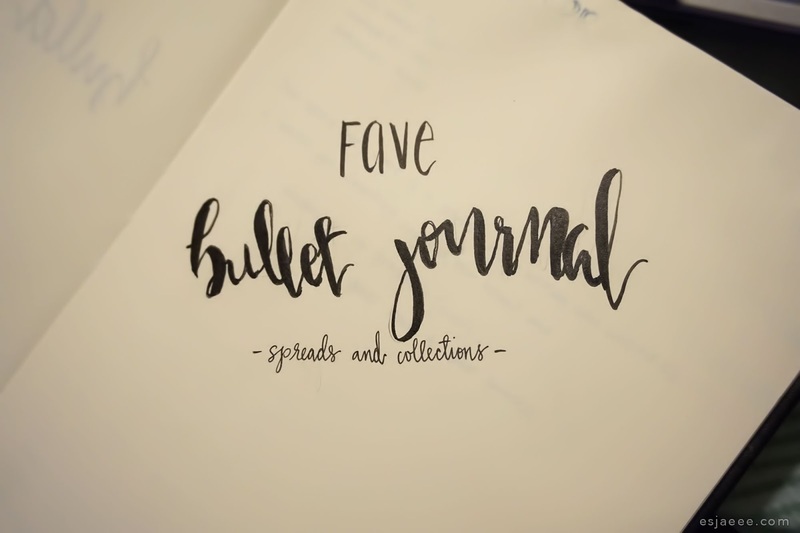 At first the concept of the bullet journal confused me and she suggested for me to watch Ryder Carroll's video and Boho Berry's Bullet Journal 101. After getting the grasp of this, I enjoyed looking through inspiration on Instagram and on Youtube. But when it comes to doing the spreads and collections, I was daunted by the thought of it. 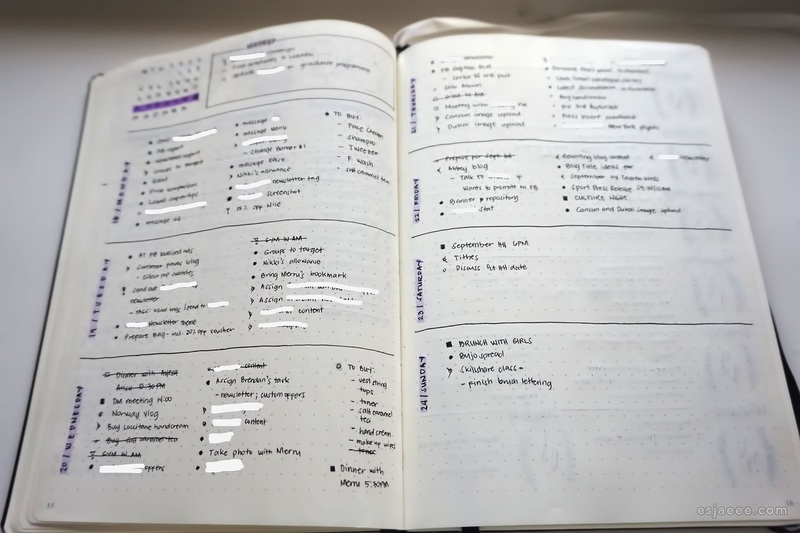 Even though I did my spreads every week/monthly, I felt unmotivated and it was so time consuming. 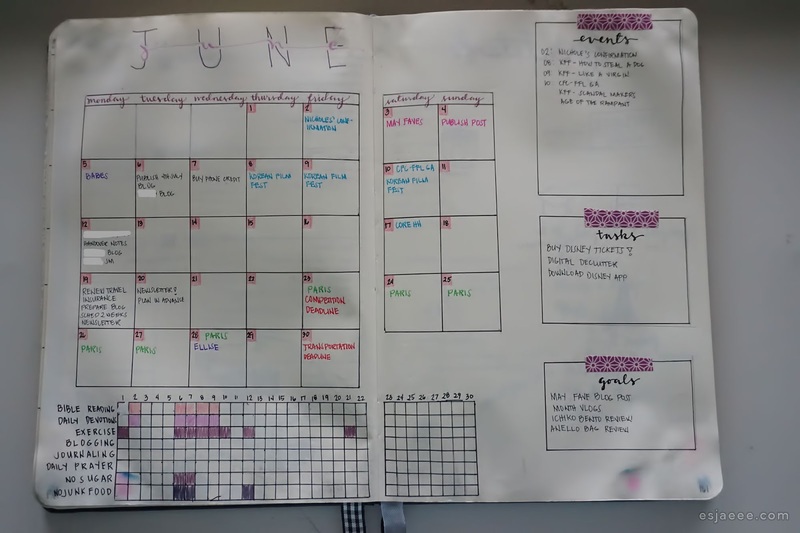 But by April of last year, I found a layout that worked for me and I felt motivated then. So below are the spreads that I enjoy. 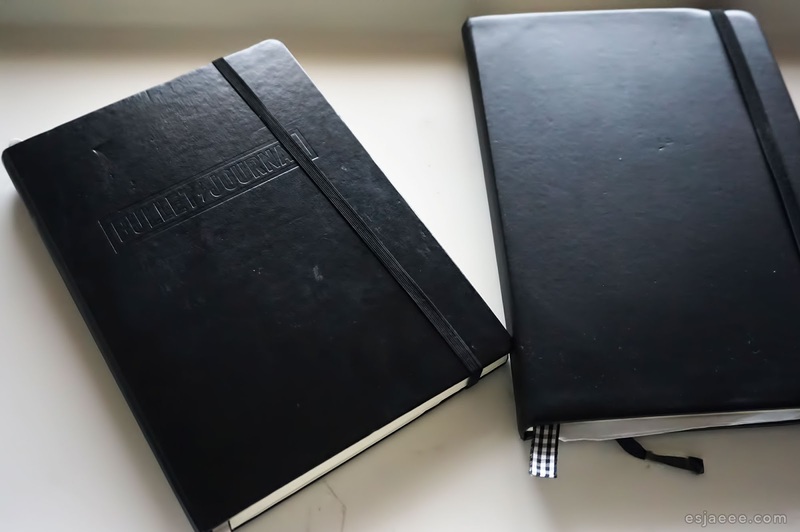 But before I get in to my favourite spreads and collections, here are the journals that I've used and am using. My first journal was an Agenzio A5 Plain Notebook from Paperchase. I now use the Bullet Journal Leuchtturm1917 Dotted A5 Notebook which I got from Amazon. Please ignore how bad I was with my habit tracking for this month (and in future monthly logs). I found this layout was very much inspired by bullet journalist on Youtube and on Instagram. 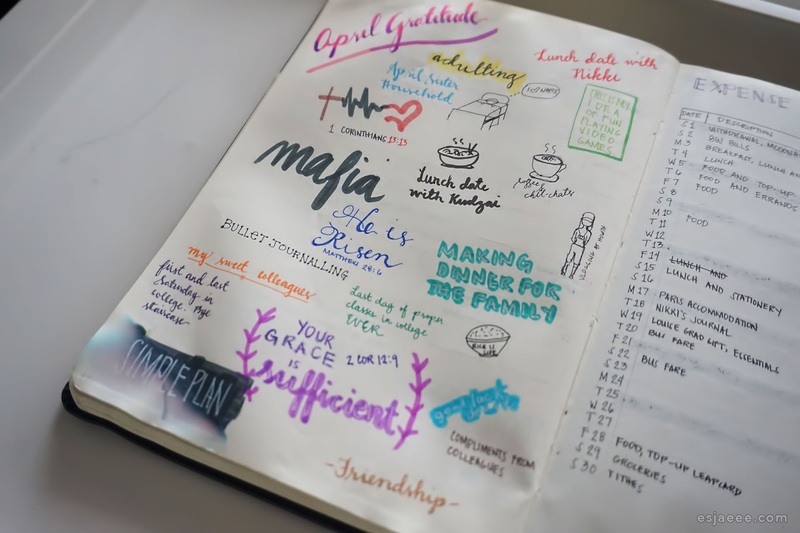 I loved how aesthetically pleasing this spread looks. And excuse the black ink bleeding through this page. The next image will explain why it looks like that. 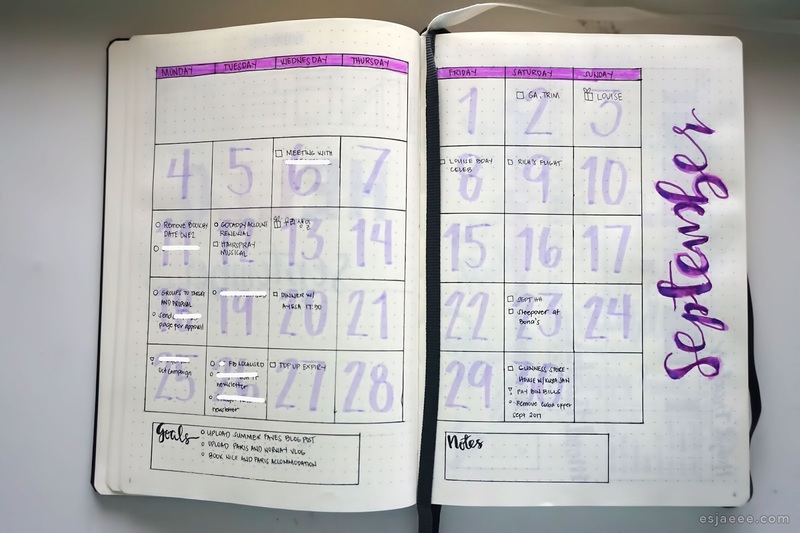 April was also the month when I first attempted to try this kind of set up where I had my weekly on the left and the daily on the right where I wrote as I went about my day. 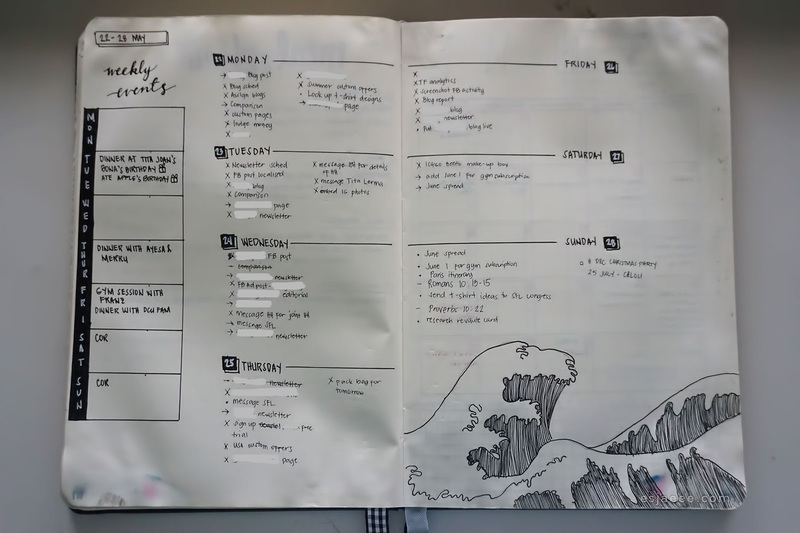 At first I thought this kinda set up was just a waste of time having the same thing written on both pages but it actually helped with my procrastination. With this being said/typed, everyone is different and everyone has their own preferences. 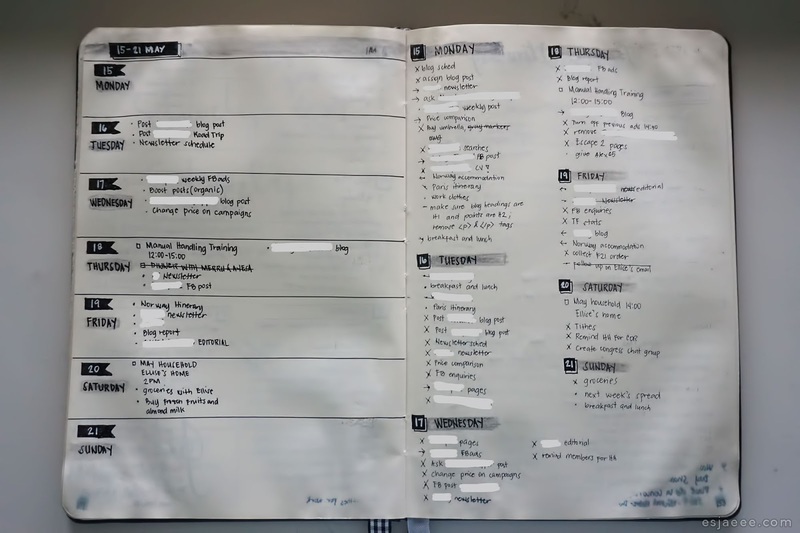 That's the beauty of the bullet journal - you can keep it as simple and minimal as possible or you can let your creativity run wild. IT IS UP TO YOU! So do not feel limited or too overwhelmed with what you see on social media. 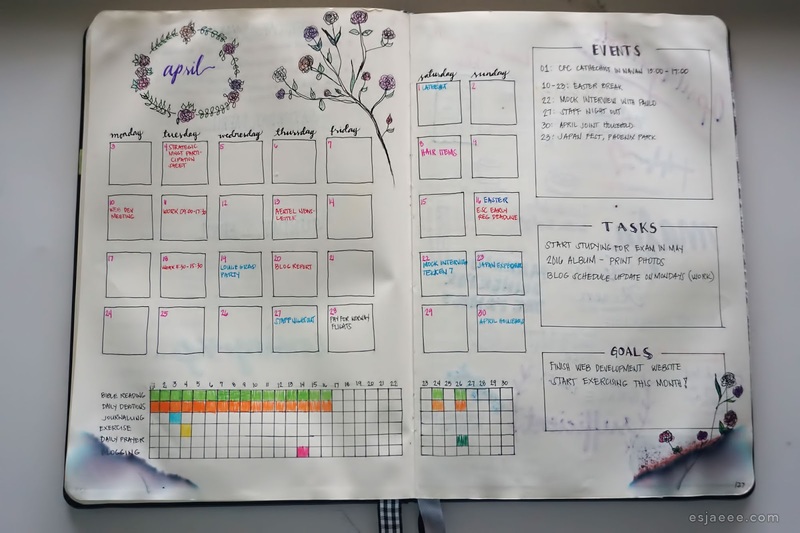 I've changed things up with the photo above where I switched to just doing a whole spread with a weekly log. 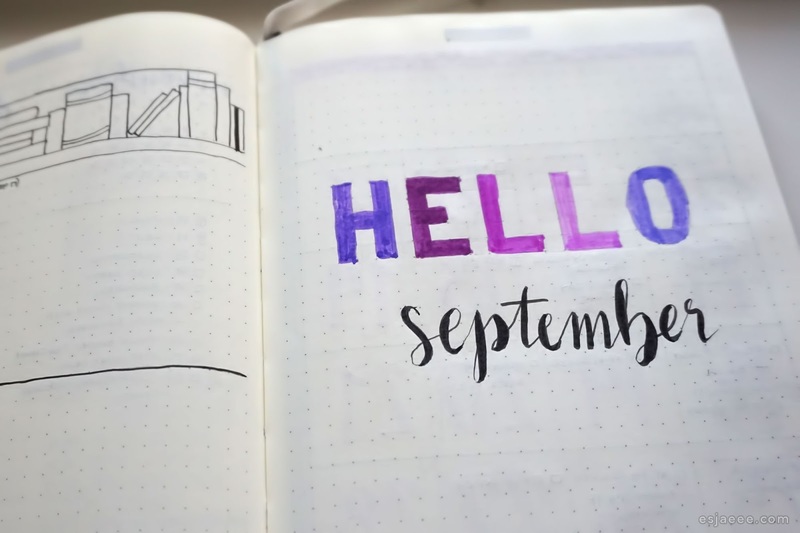 Changing things up keeps bullet journalling a lot more interesting! My May set up/theme is probably my favourite up until now. I love how minimal I've kept it and sticking to one colour. Before the April and May ... (I cannot remember the term for all your spread and collections of the month. Is there even a term for it? If you know, comment below!) I used to change the theme every week or I didn't stick to a theme/accent colour for the month which I found so stressful and such a time waster (this is only my experience. It could be different for others). Sticking to a theme for the month helped me with my time as I already knew what accent colours to use for the month. I cannot thank AmandaRachLee enough for inspiring me to do accent colours of the month! LIFE SAVER! I've managed to complete the entire year in one journal though I skipped on weeks when I had nothing going on especially during the holidays. 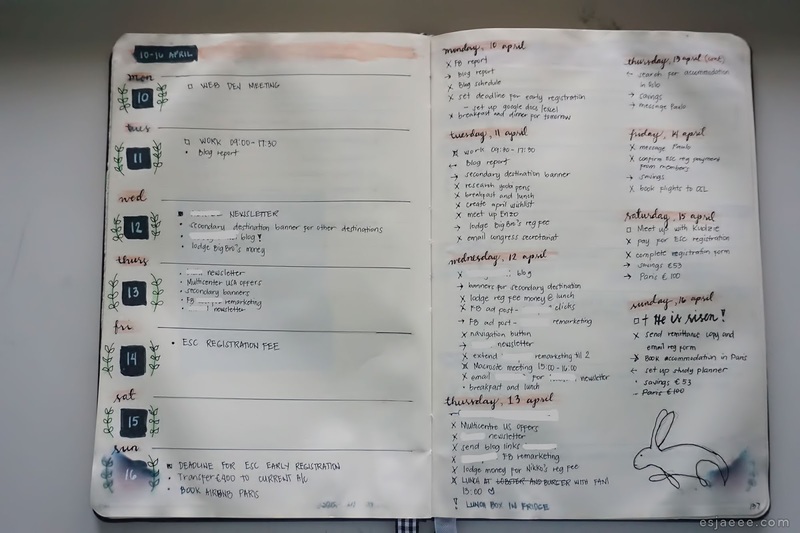 The past two future logs that I've done, there were so much going on with the colours and looked so hectic. I actually like how simple this spread looks and kept everything minimal and just accented it with my amateur brush lettering. 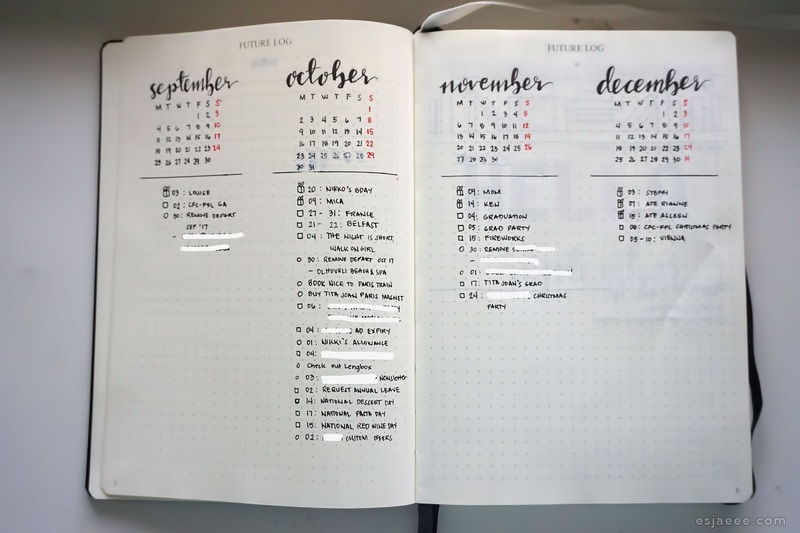 This is by far my favourite monthly spread. This was inspired by Sheena of SheMeetsCity! I love how you just write your tasks/events against the date without having to worry about the space. I am not the most creative and artistic person but I want to be. I wanted to draw on lavenders but do not know how. I've googled drawings of lavenders and somehow managed to end up with the above which do not look like lavenders at all! But I love it. 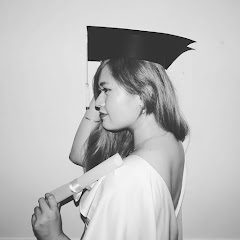 It reminds me that I can do it when I put my mind to it. I apologise for a bunch of digital white out marks. There were entries involving work that I had to keep it private! It took me an hour trying to cross off all these details. I think I should just take a photo of a freshly made spread to avoid this!